When fellow families of June Fourth victims published the open letter to Two Congresses earlier this year, they, sadly, had no choice but to move Du Dongxu (杜东旭), a name respected by everyone, from the signature section to that of deceased members. Mr. Du left us on November 7, 2013, at age 86. Mr. Du was a soldier, but not the only soldier among us families of June Fourth victims. Since we found him in the early 1990s, he had always stood with us in our struggle. Even in the most difficult moments, moments filled with dangers, he, as always, had never forsaken us. 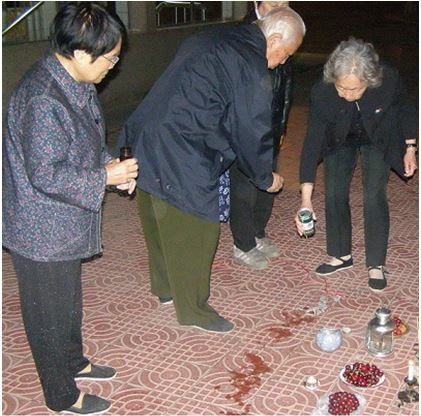 I remember on the eve of the tenth anniversary of June Fourth, fellow families of victims in Beijing held a group memorial ceremony in my home. Mr. Du was one of the participants. Outside, plainclothes police and all sorts of vehicles surrounded us. He participated in the 15th and 20th group memorials as well. He even joined in the street memorial ceremony in Muxidi on June 3, 2008, right under the glare of surveillance by a large number of plainclothes police! But ultimately, he wasn’t able to defeat his illness to make it to the 25th anniversary, and we won’t be able to see him in our group memorial this year or ever again. Mr. Du and his wife Qian Putai at street memorial ceremony for June Fourth victims at No. 29 Muxidi, Beijing, evening of June 3, 2008. In the period leading up to Tomb Sweeping Day, Mr. Du’s tall and strong frame and his forever generous and gentle smile often appeared before me. All kinds of scenes from our nearly 20 years of acquaintance have long been engraved in our memories. As early as in 1993-1994, we had already been under surveillance by plainclothes police sent from security authorities, causing a significant stir and widespread attention on campus. Some of the people we knew well kept themselves away from us, but at the same time, some strangers became close to us because of that. One day in 1994, a young girl we didn’t know came to my home. She introduced herself as a student at the journalism department at Renmin University of China—the same department that Ding Zilin was in. She gave us information about a family member of a victim—Du Dongxu. This passionate girl’s father served in the army with Du Dongxu and lived in the same residential complex for retired cadres. Her father felt great sympathy for Du over the death of his wife, Ma Chengfen (马承芬), who was killed by the martial law troops, and the two families kept in close touch. Thus the information she offered us that day was very detailed and comprehensive, including Mr. Du’s correct home address and phone number. But I couldn’t get in touch with Mr. Du right away because plainclothes State Security officers were stationed outside our door and watching us. We waited several days, but the police were still there, which made us anxious. A fellow victims’ family member, Zhang Xianling (张先玲), happened to visit us, so Ding Zilin gave her Mr. Du’s home address and asked her to make the visit first. As soon as the plainclothes police withdrew, we took a taxi van from Renmin University to Du’s home in the Maolinju community in Muxidi. We went in a roundabout way, by the Chinese Military Museum, because at that time, Ding Zilin still did not have the courage to drive past the place in Muxidi where her son was killed. From that day, our two families began a friendship that was continuous and marked by deep affection that would last for 20 years. A native of Jilin, Mr. Du had the openness and candor of a Northeasterner and was a typical professional soldier. At the same time, he was a good-hearted elderly man who loved calligraphy and painting. We believe his professional life must have, deep in his heart, have conflicted with his character and temperament, resulting in pain and an unbearable burden. As we observed from our interactions with him over the years, as well as his interactions with other fellow families of victims, Mr. Du, just a few years older than we are, often unintentionally showed his sincere nature, and sometimes even displayed a sense of ease and relief. In our first meeting, Mr. Du candidly told us how his wife was killed in June Fourth. It was on the night of June 3, 1989, and martial law troops had opened fire and begun killing people around Muxidi. This was where the confrontation between the people and troops was most intense, and where many people were killed and wounded. At around 10 p.m., a military vehicle from the west opened fire on residents in the alley just 200 meters away from the street. At that moment, Du’s wife was sitting on the steps downstairs, talking to some elderly women and an elevator operator. Du was standing two meters from his wife. Suddenly, there was a burst of random shots, and a bullet hit her lower right abdomen. She fell instantly, bleeding all over the ground. Seeing that her breathing was labored and she seemed to be dying, neighbors sent her to the nearby 304 Hospital for emergency treatment. After an hour-long, sloppy surgery, she was sent to a room but was not given oxygen supply. Everyone thought she was not seriously injured and had dodged a catastrophe. Who would have thought that she had already stopped breathing when she was lifted into her bed. She left behind two sons and a daughter. At that time, Mr. Du was already retired. But he still had many former subordinates working in the government in Beijing, and in leadership positions. When they heard the tragic news, they all expressed their sympathy in person to their former superior officer. Du asked nothing of them, only that they report the incident to higher authorities, so that he could get an explanation for the death of his wife, who did nothing wrong. But all he got were declarations of powerlessness to do anything, head shaking and sighs, and urgings that taking care of himself was the utmost priority. The old soldier was stubborn. Since no one could help him, he buried his wife in Jinshan Cemetery at his own expense. Then he wrote letters to the authorities time and again, asking for information that could provide an explanation. But like throwing a stone into the ocean, he heard nothing back. He gave up all hope in the Party’s army, which he served for most of his life. The pain in Mr. Du as he told the story touched us deeply. His second wife Qian Putai (钱普泰), a teacher, listened to him quietly by his side. Mr. Du lived alone and no one took care of him after Ma Chengfen’s death, so friends introduced Qian to him. Qian is a retired, well-educated secondary school teacher. Her first husband passed away and she married Mr. Du in Beijing in 1993, bringing along her young son to Beijing while leaving her older daughter in Chengdu. Qian came from south of the Yangtze River, and is considerate and meticulous. She took good care of Mr. Du. Ever since he started participating in Tiananmen Mothers’ activities, Qian joined Mr. Du, hand in hand, for nearly 20 years. She not only signed open letters along with Mr. Du asking for justice for the victims but also accompanied him to various group events with families of victims. This old couple meticulously accomplished every task entrusted to them by fellow families of victims, participated in tracking down other families of victims, and provided leads to victims. Braving the cold, the heat, or fatigue, they visited families who suffer the same fate one after another, delivering materials, passing on donations, and collecting signatures for open letters one by one. They have left their footprints across the city of Beijing—in Chaoyangmen and Hujialou in the east, and Shijingshan and Shougang in the west—as well as outside Beijing, in Chengdu, Sichuan Province, and Yancheng, Jiangsu Province. How can we forget all of these events over the last two decades? 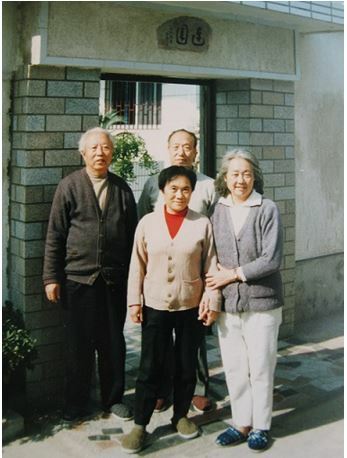 Front row: Mr. Du and wife Qian Putai, with Ding Zilin at her home in rural Wuxi; back: Zhao Tingjie, member of Tiananmen Mothers. Both Du’s current wife Qian and Ding Zilin were born and grew up in Shanghai, so they usually spoke Shanghainese with each other, which brought them close together. When our house, Lianyuan, was built in the rural area of Wuxi, we invited fellow victims’ families separately to stay there to relax. In 1997, Mr. Du and his wife and Mr. Zhao Tingjie (赵廷杰) came together to stay at Lianyuan, and we had a joyful half month together. They explored the city in the daytime, and we sat up talking in the courtyard at night. At that time, commuting between urban and rural areas in Wuxi was not that easy, and our relatives didn’t have cars. So they took privately run taxi vans. The couple went out early every morning with joyful expectations and came back in the evening fully content. Looking back now, all of this seems just like yesterday. Before the tenth anniversary of June Fourth in 1999, the Tiananmen Mothers brought a case to the Supreme People’s Procuratorate against Premier Li Peng, who bears key responsibility for the massacre. The authorities were so fearful and nervous about it that they put us under house arrest for as long as 45 days, when a multitude of plainclothes officers and their vehicles big and small were on duty all day outside our home. In that period, we were forbidden to go out and visitors were questioned and required to show credentials. Therefore relatives and friends did not come to look for trouble in that “extraordinary time.” But the Du couple wasn’t cowered by this iniquity! One day, they came to our home—43 Jingyuan Building No. 1 at Renmin University of China, with dignity and fully prepared. They presented their credentials and registered as required. As a result, the plainclothes police had no choice but to let them—a retired army officer and his wife—in. During our lengthy isolation, in a situation of extreme psychological pain and resentment, we were naturally surprised and comforted by their visit. How precious this support was! We talked a lot that day, and couldn’t tear ourselves away from them. We stood by the window for a long time to see them off. We saw Mr. Du stride forward in big steps, chest out and head up, looking straight ahead and paying no attention to the plainclothes police. Mr. Du at the remembrance ceremony of the tenth anniversary of June Fourth, 1999. His usual response to people who tried to “advise” him: “Don’t you often teach people that the military and the people are close as fish and water? Why don’t you talk about it now?” This would just stump them. When he recounted the story to us, he couldn’t help laughing out loud like a child. What a fantastic retort! Later, this reference to the fish-and-water closeness between the military and the people became the object of ridicule among the fellow family members. Mr. Du was an elder among us fellow family members of June Fourth victims. He earned everyone’s trust and respect with his courage to take on tasks and his generosity and candor. He often solved problems for us. He took part in the discussion of every open letter earnestly, from proposing the title to finalizing the draft. After the 10th anniversary of June Fourth in 1999, one of the members, Zhou Shuzhuang (周淑庄), suffered a stroke due to overwork, leaving her paralyzed on one side of her body with little mobility. 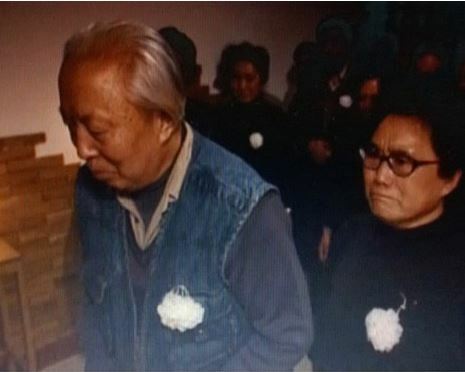 To make sure the Zhou couple could join the discussion, the meetings of fellow victims’ families were held in her home. I still remember in the lead up to June 4, 2001, a heated debate broke out among us when we were discussing the anniversary article, “Words of the Tiananmen Mothers.” The focus was on condemning the authorities’ brutal suppression of Falun Gong practitioners two years earlier. At that time, arrests of Falun Gong practitioners were still taking place and people were apprehensive about dangers that they felt were lurking in every corner. Condemning or keeping silent about this significant matter had to do with our attitudes toward universal values. When we couldn’t resolve it and were anxious about it, Mr. Du came in the house from the courtyard with another elder, Zhou Shuzhuang’s husband Duan Hongbing (段宏炳). No one noticed when they came in. Mr. Du told everyone slowly: “I discussed with Lao Duan just now. What do you all think if we just keep the wording of condemning the authorities’ suppression of Falun Gong? This is a big issue in the country and we should state our position clearly. But we should make it brief because, after all, Falun gong and June Fourth are two different issues.” Just these few words settled a rare argument among the Tiananmen Mothers. Jiang Peikun (蒋培坤), immediately revised the article following their suggestion, which was agreed upon by all the participants. Duan and Du are no longer with us, but this story vividly demonstrates the fact that the efforts and wisdom of these two elders had a lot to do with what the Tiananmen Mothers have been able to achieve. Through twenty years of contact, our fellow families knew Mr. Du well, particularly that he was excellent in calligraphy. Many asked for his calligraphy, and he never refused anyone’s request. Every time a fellow family member passed away, we always asked Mr. Du to write the elegiac couplet, including those for Su Bingxian (苏冰娴), who died in 2001, Duan Hongbing, who died in 2010, and Yuan Kezhi (袁可志), who died in 2012. It was only after Mr. Du wrote the couplet for Mr. Yuan that we found out he himself was living with terminal-stage metastasized cancer. Afterwards, our heart ached for him. We blamed ourselves for our thoughtlessness. All we knew was to ask him for help and relied on him when there was difficulty, not taking into consideration that he was already advanced in years. In the second half of September 2013, before we left Beijing to return to Wuxi, Mr. Du was critically ill, but he was still very alert. When he learned that we wanted to visit him in the hospital, he insisted, like a child, to go home to meet us. But we persuaded him to stay in the hospital. Sure enough, shortly after we returned to Wuxi, Mr. Du completed his 86-year life journey on the morning of November 7. We asked Ms. You Weijie (尤维洁) to present a wreath and condolences on our behalf. The annual Tomb-Sweeping Day for families to pay respects to their loved ones is approaching. At this moment, as we honor the memory of our parents and our son Jiang Jielian (蒋捷连), how can we forget those deceased fellow victims’ family members who had shared our trials and tribulations like our own family: Xuehan (学汉), Bingxian (冰娴), Mr. Duan, Mr. Yuan, Mr. Du, and others, the more than thirty suffering brothers and sisters. We can only vow that we will persevere till the last breath of life! Jiang Peikun (蒋培坤) is a member of the Tiananmen Mothers. He is the husband of Ding Zilin and father of Jiang Jielian, who was killed by government troops on June 3, 1989. Jiang was a professor at Renmin University of China.